Columbus, Ohio, USA: The Indie Arts Capital of the World — Independent artists, crafters, and small businesses are creating amazing works right here in Columbus. 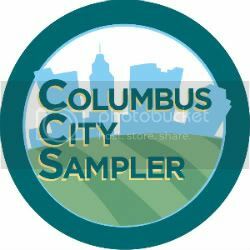 Consumers can receive a representative sampling of their work by ordering the Columbus City Sampler for only $20. The Columbus City Sampler will go on sale April 7 at HomeOfTheSampler.com. Inspired by City Samplers from San Francisco, Brooklyn, and Boston, Columbus Sampler curator Amy Neiwirth wanted to showcase the incredible talent in our own capital city. “This is a wonderful way to highlight that creative, do-it-yourself spirit we have in Columbus,” Amy says. Working with Alison Gordon of homeofthesampler.com, Amy helped organize the Columbus City Sampler by seeking contributions from fellow artists, crafters, and indie business owners. The City Sampler is an exciting venue for these individuals to promote their original creations, events, and services while showcasing the city of Columbus. Those who purchase the City Sampler are in for a treat that is well worth the money. The Columbus City Sampler features contributions ranging from buttons to earrings to small prints and more. Each City Sampler will include a selection of items from the following contributors: Adam Brouillette/Little Red Men; AmyD; An Artful Note; Anne Holman Jewelry Design; Bead Noir; Betty’s/Surly Girl Saloon; Bootleg; Couchfire Collective; Crafty Beavers; Jennifer Sadler Designs; Kiko Kreations; L. Cabanero Designs; Lisa’s Paperdoll; Locura; Lucky Kat; Lusterbunny; Made in a Treehouse; Moogan Creations; Out of the Pink Sky Designs; Patrice Lehocky; Rivet; Sharon Bell/Dirty Booty Clothing; Spacedog Studios; Sparrow Design Works; Sweet Stella Designs; What the Rock; and Wholly Craft. About The Sampler: The Sampler is a marketing & promotional tool for indie businesses. Each month, independent crafters, artists, shops, ‘zines and record labels who run web-based businesses send samples and promotional materials to a contribution pool. All the samples are photographed, posted to the site and then are portioned out, packaged and sent to Sampler subscribers, other Sampler contributors and members of the media all over the world. Past contributors to The Sampler have received national attention in ElleGirl, CRAFT, Adorn, Bust, Venus, and Readymade magazines, as well as in indie blogs such as Craftster, Rare Bird Finds, Modish, and IndieFixx.